Having fun with art gallery ups and downs and sideways. I didn't really have expectations as to how the whole logistical configuration of transitioning from a brick and mortar gallery to an exclusively online art gallery would look or feel. Oh my! There is a huge difference. I think first off that it is more solitary than anticipated. Yes, I'm still dealing with artists and their needs and questions, but it's via email or Messenger or texting. But I can't see their eyes brighten while they're texting about a new project. I can't hear the excitement in the artist's voice as their words come faster and faster about trying a new medium. There's little face-to-face interaction, other than, yes, going to art exhibits and talking with the artists at the various show venues about their concept, their story, execution of their work. As introverted as I deem myself to be, this loss of activity and interaction enjoyed in the gallery has been unexpected. And of course it prompts me to consider generally how solitary an existence creatives lead. I think I'll mull this over and come up with regular meet-ups in artist studios, or perhaps invite artists to periodic art salons. A problem presents that without a gallery, WHERE? There must be such gatherings in other areas. I'll have to research this and follow through, as I've heard from other artists that they, too, long for exchange of ideas and art processes, and what's going on in the art world outside of Spokane. If anyone has suggestions or is agreeable to sharing what they are doing in their communities, I would be most appreciative. One artist to another. Here we go! April 20th is the deadline for submissions for "Select Impressions," the first of what we hope will be many online art exhibits brought to you by Little Dog Art Gallery. There will be no more than 21 works of art exhibited in the upcoming monthly online art shows. This enables viewers a good selection of art to look at and determine their purchases, without being overwhelming. Some of the shows slated for the brick and mortar gallery have been shelved for the time being. It's sometimes challenging to show well fiber art pieces or three dimensional works within a two dimensional context. We've worked to come up with exhibit themes and media we hope you'll find visually appealing. For the time being, each show will include the work of various artists. 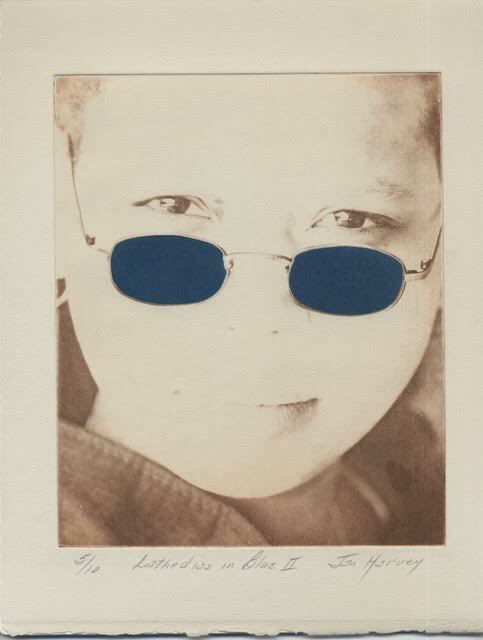 We may slip in some solo artists exhibits from time-to-time down the road. The art will be available for purchase, which can be handled directly through the website, for your convenience. We hope you will provide us with feedback if you encounter any difficulties using this system, so that we might remedy such problems and make your online purchase as easy as possible. Please fill out the Contact information on our Little Dog Art Gallery website to receive notification of change of online show. More information to come about the May printmakers' exhibit "Select Impressions." We hope you'll enjoy the upcoming shows as much as we've enjoyed creating them for you! I Wonder Where THAT leads? 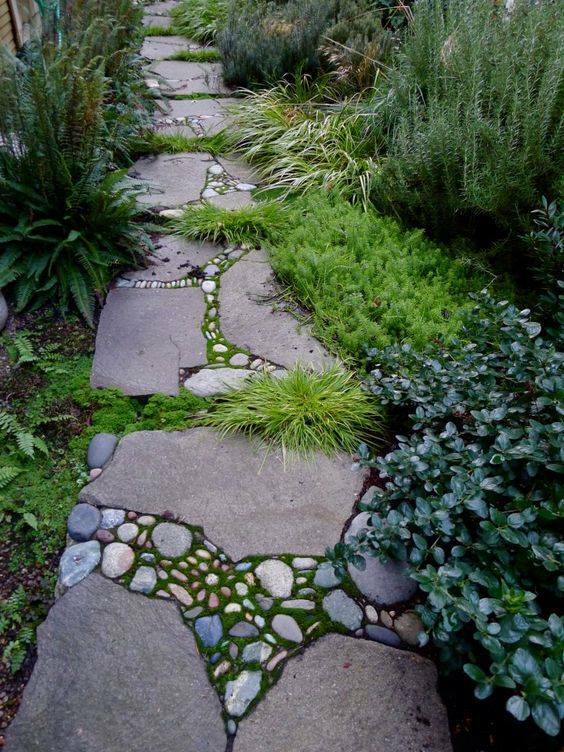 Isn't it a pretty walkway? I'd give photo credit if I knew who the photographer was, but I don't. Sorry. I'm sitting in the gallery, on hand to welcome any stragglers stopping in before the doors close for good. That would be at 5 pm Tuesday. Yup! Day after tomorrow. Amazing, right? Get over here while you still can! So, as I sit here I'm looking at walkways. Pretty. Has rather a metaphor sort of feel. Paths. Roads taken or not. Forward movement. The gallery cactus just left, carried off on its new adventure, a new home with a dude named Clint. I snipped little bits from cactus that I'll plant and have little baby cacti. Why? Where will I put them? It's spring, I can't help myself. Things are growing. Paths are beckoning. It's Saint Patrick's Day and Garland Avenue in Spokane is getting on its Irish! Later tonight is a Pub Crawl, that from reservations made already looks to be successful, but earlier is Little Dog Art Gallery's last art reception. The gallery show Gaelic on Garland (et cetera) is up until end of business Tuesday, March 21st. But tonight is cause for celebration, setting aside the commercial aspects of selling art, and celebrating the creativity of the artists who have shown their work here. Looking at Karen's painting of an Irish dancer, I think of how rigidly such dancers hold their bodies from the waist up, their arms straight at their sides, hands immobile, while their legs and feet are constantly in motion with intricate stepping and leaps. It makes me reflect on how owning and managing an art gallery is similar to Irish dancing. The public persona is cool, professional, calmly answering visitors' endless questions, providing insight in to the various artists' approaches and back stories. But the other component of the gallery dance is the blurring footwork that goes on: seeking and meeting new artists, getting their information and photos, coming up with show themes, contacting prospective and proven art buyers and collectors, making sure communication with everyone is clear, designing and hanging the artwork, shuffling business forms and reports, bookkeeping, making sure everyone receives their commission checks, endlessly coming up with publicity ideas, printing, mailing, collaborating with other galleries and art organizations, THEN all the social media to maintain with regularity. Dance, dance, step, leap, don't fall on your face (too often), point your toe, leap, hop, even distribution of weight! Yes, indeed! Running an art gallery keeps one on their toes, Irish or otherwise! "What are you going to do when the gallery closes?" This is probably the most asked question by friends, acquaintances, and total strangers, when they find out I'm closing Little Dog Art Gallery. I have a whole list of ideas, projects, bucket list items from which to choose. 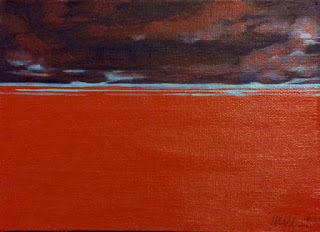 I'm planning to maintain the Little Dog Art Gallery blog and website. The website is set up for online sales. A year ago, the gallery was just such an idea, quickly jumped into primarily because a desirable space came available. I had a business plan, a whole city of talented artists from which to create shows and displays. I ran out of operating capital before I ran out of ideas. Those ideas are still churning around in my head. I've made a small impact in this community, so I hope to follow through with that momentum, perhaps promoting standalone displays of artists' work in alternative venues or locations, for varying duration. I feel the urgency to do something while the reputation the gallery has gained is still of significance in the community. Everything moves so quickly these days. Work it or lose it. I don't know yet what the new day brings. I see the promise and potential of a new daybreak. Now that the hard decision has been made, not to continue the brick and mortar gallery for another year, there's a bit of a lull, a drop in energy, a feeling of coasting. I went to an art reception last night at Kolva Sullivan Gallery to see the last day of curator Jennifer LaRue's show featuring the works of Ric Gendron and Karen Mobley. It was an interesting meld of totally disparate art renderings. Gendron's were vibrant with color and emotional impact. Mobley's were more intellectual studies in line and form, devoid of color. Interestingly, they worked together as a compatible show, allowing the viewer to savor different approaches. 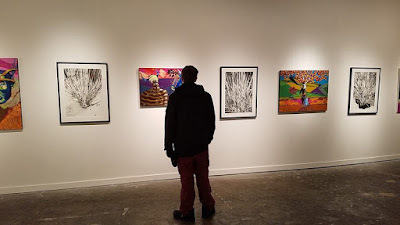 I came away from that visual feast with a touch of sadness, in that I no longer have reason to see art other than to just see and personally experience the art. I am no longer planning ahead to future Little Dog Art Gallery exhibits, no longer need to evaluate art and artists for that purpose. A part of my persona has become seemingly defunct. An alternative way to function relative to art is imperative. Just viewing art unilaterally isn't what I want. I don't relish this solo limbo dance. Curious and excited to discover what comes next. However, all that aside, "Gaelic on Garland (et cetera)" is coming in next Tuesday, and I do relish welcoming the art and the artists, and seeing how to mix it up resulting in a good Little Dog Art Gallery finale. I've thoroughly enjoyed creating and mounting all ten exhibits I've put together for LITTLE DOG Art Gallery. Each one was distinctively different from the others; most had a theme, which changed each month. I've never had a solo show for an artist. I thought I might get around to that as time progressed. I wanted to offer a variety of work to entice gallery visitors. My favorite show was probably "Origins of Fear," a show I invited Megan Holden to curate. I sent out a call to artists, and Megan juried what came in. We had a great number of submissions, but Megan was clear about how she wanted the show to look, and was ruthless in turning aside art. She chose well. I may have enjoyed this show best because there was incredible viewer interaction. 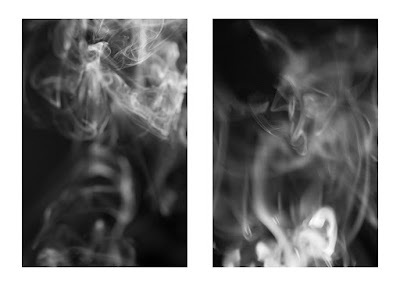 Callahan Freet had photographs "Fabrications" of ambiguous smoke shapes and viewers were invited to write down what fearful things they saw in the smoke. It was fascinating to see all the different interpretations. 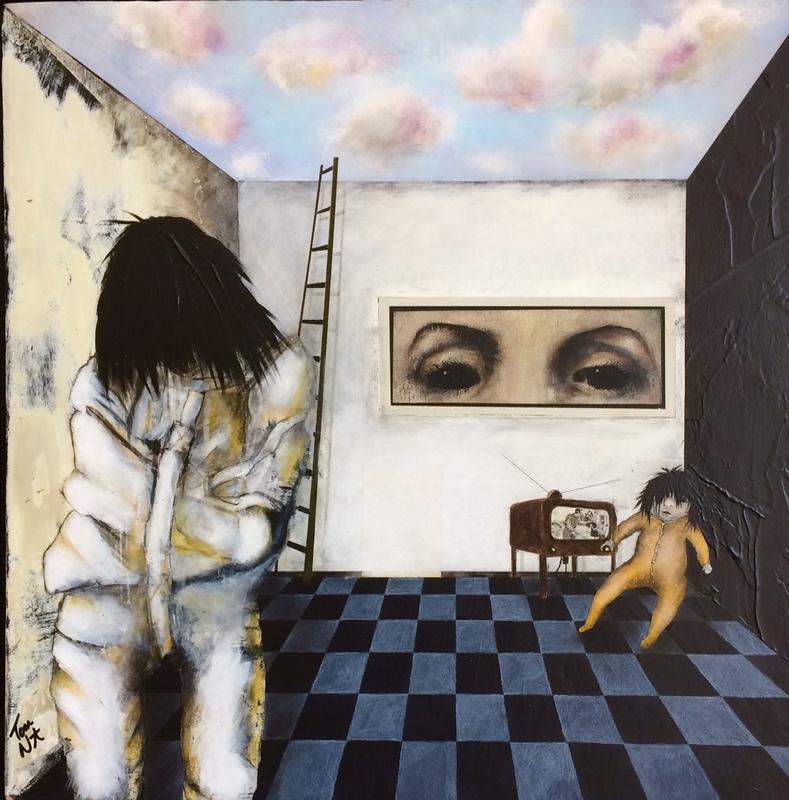 The other work in "Origins of Fear" was sometimes upsetting and off-putting, like Tom Norton's "Room 208 aka Mother Please," or Joseph Tomlinson's "Wait til They're Asleep," but some dynamic came into play, where because it was portrayed in art on the wall of a gallery, a dialog opened up and people spoke openly about their own fears and experiences. It became almost a group therapy, a sharing of the experience of fear. Yes, each exhibit had it's own power and identity. They were ALL incredible shows. "Horse/Crow" is coming down February 28th, and was a vibrant and colorful exhibit. With the dreary winter weather, I hoped this showing of bright work would help dispel wintry blues. Gallery visitors have responded well to "Horse/Crow" and have enjoyed the dual features of Terry Davitt Powell's monoprints and Clancie Pleasants paintings. Both artists are strongly influenced by crows and their interpretations are distinctively different, and at the same time visually compelling. The work of these two artists, Terry Davitt Powell from California and Clancie Pleasants from Idaho, was accompanied by eight other Spokane artists' concepts of crows and horses. The anticipation is building momentum with the end of the above show and the incoming "Gaelic on Garland (et cetera)" exhibit for March. As I'm sure you might guess, the theme of March's show is tied in with Saint Patrick's Day. The Garland District is hosting a Pub Crawl on March 17th, the same day the gallery will have their art reception. I had anticipated the March show being specifically centered around Irish subjects, or Celtic, or Emerald Isle. However, gallery logistics have forced a different aspect to this show. 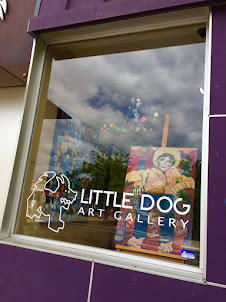 LITTLE DOG Art Gallery will not be renewing our lease in April. It's been a rather sudden decision, but one well thought out and necessary. Regrettably this makes the March exhibit the last show, and the gallery will close April 1st. 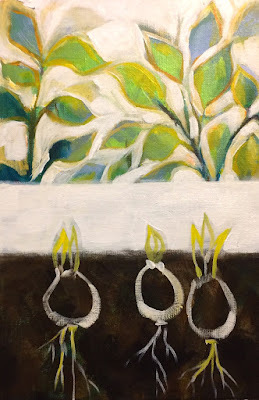 Because there are many artists who have volunteered and supported our gallery efforts, I've invited them to at least show their work in the gallery before it closes, hence, the "et cetera." Those works will be general interest and not specific to Irish theme. It's still exciting to plan a new show and to see how it shapes up. 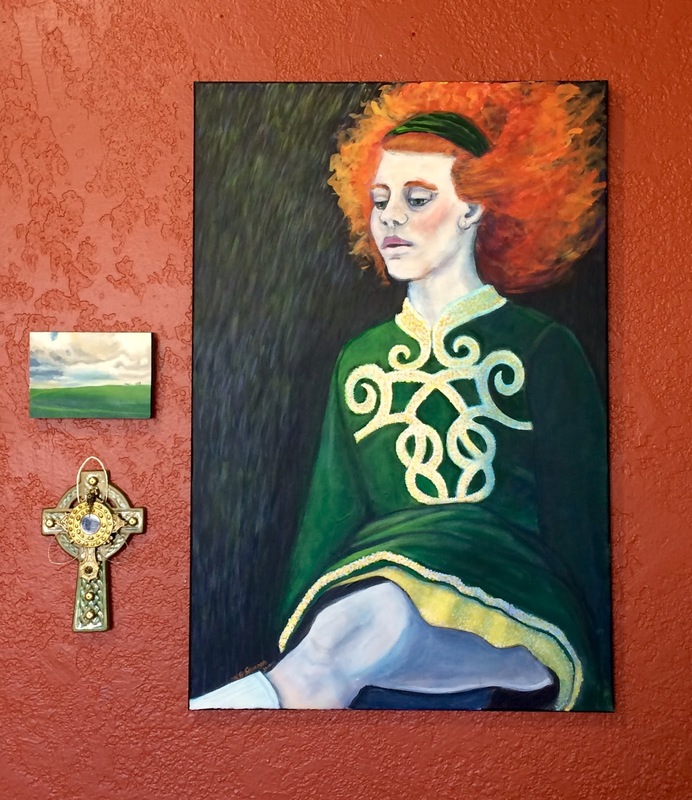 There will be a YA fantasy author's talk March 11th (Kate Poitevin's Saving Tir Gaeltacht), the artists' reception on March 17th, and a Celtic Henna activity with Kim Long on March 18. "Gaelic on Garland (et cetera)" will come down and the gallery will close on March 21, 2017.